Since the cause of endometriosis remains unknown, there is no cure for this debilitating disease. Clinical trials for endometriosis are working to develop treatments which can better control its symptoms. New clinical studies have been evaluating the effectiveness and safety of promising compounds that can be administered intravaginally. Future endometriosis research will look into the application of drugs that selectively inhibit inflammatory cytokines. If you are interested in enrolling in an endometriosis clinical trial, then you may be among the first to receive an experimental treatment not available anywhere else. Although positive benefits could be realized, applied therapies or medication is still experimental. If you have exhausted the more conventional treatment options for endometriosis, then participating in a clinical trial can be a viable option worth considering. 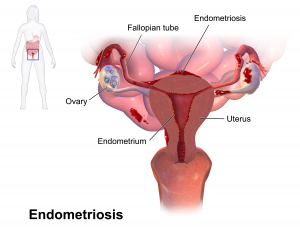 Endometriosis is a disorder which gets its name from the tissue that usually lines the interior of the patient’s uterus (known as the endometrium). If this tissue begins to grow outside the uterus (endometrial implant), patients can develop endometriosis. This painful disorder often involves the bowel, ovaries, or the tissue lining the pelvis. In some rare cases, the endometrial tissue can spread further the pelvic region. The displaced endometrial tissue will still perform as if nothing was wrong. It’ll toughen, break down, and bleed in accordance to each passing menstrual cycle. Since the endometrial tissue has no way to leave the body, it stays trapped. If the patient’s ovaries are involved, these various cysts (known as endometriomas) can develop. Surrounding tissue can become inflamed, and over time, scar tissue and adhesions (tissue that has binded organs together) will form. Unfortunately, there is still no cure that has been developed for endometriosis, but current treatment can halt progression and help manage symptoms. Birth control pills can be used to stop this painful disorder from progressing by preventing periods and inducing a pregnancy-like state within the patient (pseudopregnancy). This type of therapy utilizes progesterone birth control pills and estrogen, and it can help manage the symptoms of endometriosis. This treatment does not prevent scarring or other permanent alterations that are caused by this disease.